SCUNTHORPE SCORPIONS have completed their line-up for 2019, with the signing of 20-year-old Ryan Kinsley. The Norwich-born rider joins Josh Auty, Jason Garrity, Jake Allen, Stefan Nielsen, Jedd List and Josh Bailey in a competitive line-up. Kinsley will be a newcomer to the Championship and will come in on an assessed 2.00 average. 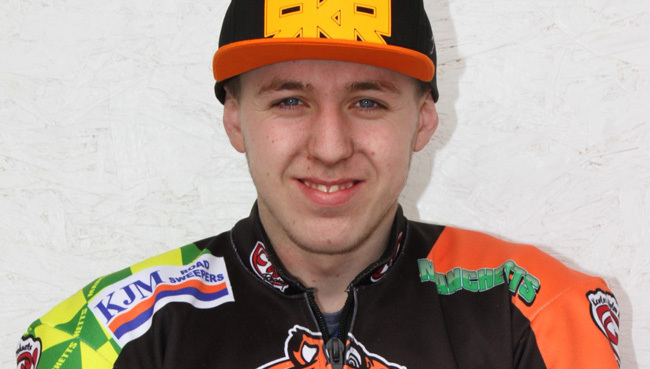 He has competed for King’s Lynn, Buxton and Mildenhall at National League level, and had an impressive season with table-topping Fen Tigers in 2018, with an average in the region of 8.50. He will form a reserve partnership for Scorpions with Josh Bailey. The two riders have ridden together at both King’s Lynn and Mildenhall. Scunthorpe promoter Rob Godfrey said: “I’ve had my eye on Ryan Kinsley for a few seasons – he won our 2016/2017 Winter Amateur Series at the Eddie Wright Raceway. “I did try to coax him into riding for us at the beginning of the 2018 season, but he had work commitments and was unable to take us up on the offer. “He’s very now keen to make that next step upwards into the Championship, and he’s made sure he’s available for us. Godfrey has also taken a look at the overall balance of his team. “We’re the first ones to reveal our hand under the new 38-point limit”, he said. “We’ve set the team up to take home wins, and then we’ll see what we can do away from home. “We’ve got a bit of everything in the team. The top four are very formidable, while we have a total newcomer to British Speedway in Jedd List, although he comes very highly recommended.